My decision to get the FP3 over my original Screaming Eagle tuner most likely comes down to a meercat, like interest in new technology and my love for analysing things. The thought of being able to mount my iPhone on the handlebars [I have a nifty little mount from Roam Accessories] and being able to watch all the performance telemetry was just mind-blowing. We all know Harley Davidson’s don’t give the most holistic info on the centre console, and here was a product promising me a view of the inner performance of my machine. The draw when I open the throttle in numbers (Not sure what you mean), the analysis of fuel performance, and of course, the ability to refine the tuning without the cost associated with a garage tune-up, or the need for expensive computer software and wiring harnesses; I was sold. A benefit I’ve not yet explored is the ability to fault-diagnose using this tool; the ability to view live engine parameters will certainly speed up investigations in future. Ultimately the FP3 does exactly what it’s sold to do. You can select the tuning desired, specifying your bike, and the configuration of exhaust and air intake you are running. This can be done by selecting the manufacturer and model of the system you have, and it does the rest for you. It’s designed to allow you to fully utilise the performance potential of your machine by tuning it to precision. 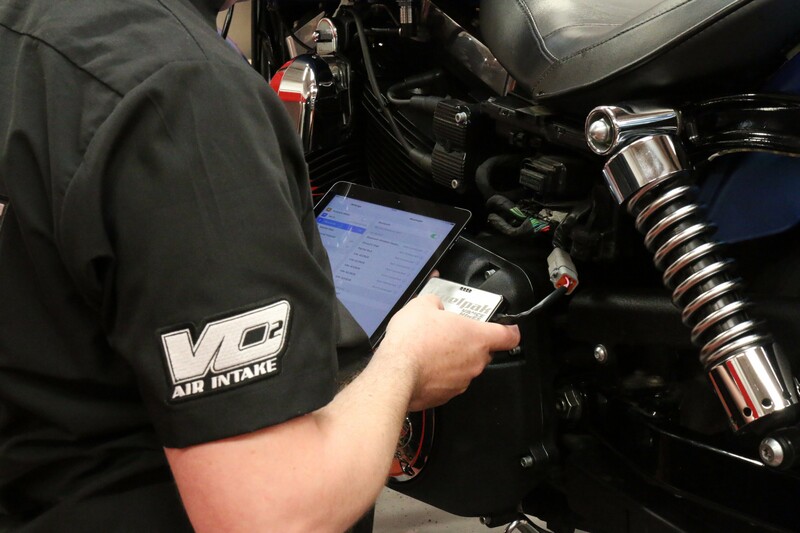 The app software is always utilising the most up to date information within the Vance and Hines database and reacting correctly. Mr. Vance and Hines, from what I’ve heard, are rather particular and detail focused guys and making sure the tuning is absolutely spot on is something they’ve nailed. The database is kept current and rest assured that whatever system you’re running you will be able to tune it successfully. The pre-set tuning options are all for higher performance items, for example, the Crusher Performance air intake. However, it is possible to tune with stock items too. For example, you’ve upgraded your pipes but not your intake. Here you need to use the Auto-tune feature; you plug it in, turn it on and ride. The system will then monitor all the sensors, tuning as your ride, and let you know once it’s done. It’s magic. If for any reason, you can’t ride long enough for this to complete you can shut down and continue next time. This feature, of course, requires you to keep the unit attached while riding. The auto-tuned feature also provides you with another layer or precision tuning for specific requirements, such as unique components [maybe you’ve got custom made pipes], or different grades of fuel. This setting utilises all the factory sensors to find the optimum set up, all very cool! Some fields you can change are front and rear spark advance, air-fuel ratio, front and rear cylinder VE, Acceleration and Deceleration enrichment/Enleanment [aka pop], idle RPM, rev limit and ACR (automatic compression release). One of my favourites is the ability to adjust the deceleration pop. For me, I absolutely love the pop from excess fuel in the pipes igniting, however for those wanting slightly more civilised sounds you can reduce this. Or of course, increase it as I did! Pop pop pop! It’s worth noting that, as with all tuning systems, it will only work on one machine. 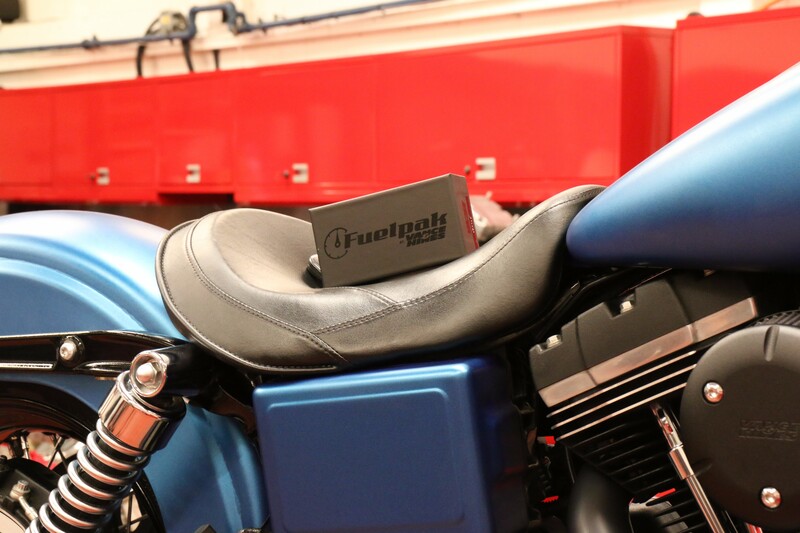 The fuel pack will link to your VIN and can thus only be used on an individual bike. As a tiny plug-in device it will fit within your battery case and be invisible. Or you can plug in, tune and remove it. I like having it plugged in as the monitoring gauges are sweet for visuals when you’re riding along. That’s the inner geek in me. It’s Vance and Hines. It’s spot on! You plug it into your machine, download the app and connect via Bluetooth, and you’re away. The app provides a list of all the custom parts you could tune to, or you can opt for the auto-tuned option and let the factory sensors do the work for you. It’s a pretty new product to market, and while Vance and Hines have a comprehensive FAQ section on their website, there doesn’t seem to be extensive user guide yet. But in all honesty, I don’t think you’ll need it. The systems are super intuitive, really user-friendly and ultimately, easy to use. Yeah, it will take you a few minutes to figure your way around the app, but that’s pretty standard. Being able to show your engine stats on your iphone is pretty unique. It’s a nice little conversation topic. Plus, its ace being able to tune for the type of riding you’re doing or simply crank up the sounds for head turning. Ultimately though, no one will know you have an FP3 Fuelpak unless you tell them. You’re looking at around £250-£300. It’s an essential if you’re upgrading parts of your system so why go with the hold when you can have the latest Smartphone tech. The extra money you spend buying it over others available, you’ll save in the ability to re-tune yourself without having to go to the dealer. 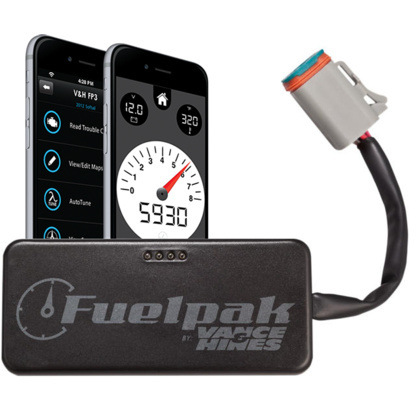 Compared to the market, the Fuelpak FP3’s ability to refine individual changes directly on your iPhone, the simplicity of its use, the magical auto-tune capability and of course the Vance and Hines reputation behind it, made it a nobrainer for me.